The 21st Century is unlike any other time in human history. Never before have we been both so conscious of the problems we face and also so well-placed to tackle those problems. Nevertheless, the 21st Century is also unique in how intensely and how consistently it buries its head in the sand and ignores the problems it knows we face. It just so happens that the problems we face are monumental: foremost, man-made climate change. There may not be a single, definitive solution to the overwhelmingly complex problems of climate change, but we know that through a combination of coordinated political effort to manage carbon resources, switching to renewable energies, reducing the use of cars and increasing the use of public transport, reducing consumption of meat, reducing factory farming and also managing the ways in which we produce our goods, we will be best-placed to reduce the consequences of man-made climate change. We know this, and yet, we are doing the exact opposite and accelerating it. Take coal-mining. Coal is having a moment. Despite global demand shrinking, the U.S.’s coal price has been rebounding. Donald Trump has pledged to reopen mines and scrapped regulations on coal emissions. 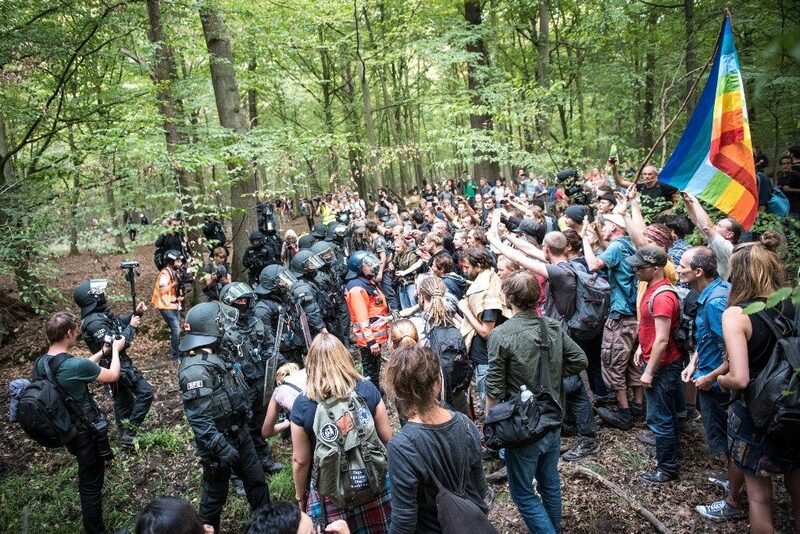 In Germany, RWE, the energy giant is now trying to expand its coal mine in the ancient Hambach Forest. As the company owns the land, it has argued it can therefore clear the forest and mine for brown coal until 2045. Brown coal is one of the most inefficient fuel-sources we have, not only does it not produce a lot of energy, it is incredibly dirty and polluting. But still, it’s cheap! Dig it up! Protests have filled the forest, and national attention is being turned to the energy giant’s plans. Greenpeace has written a public letter to Angela Merkel, criticising RWE and the regional governments of North-Rhine Westphalia, where the forest is located for facilitating the plans. Thus far a journalist has died in the protests, police have been clearing protesters‘ tree houses and large-scale protests have been banned. By court order, as of today, the forest-clearing has been temporarily suspended. Describing the cynicism with which the entire process of forest-clearing is being argued for, the Green Left Weekly wrote, „Herbert Reul, the interior minister of North-Rhein Westphalia (NRW), the state where Hambi (Hambach Forest) is located, then declared the tree-house occupations illegal “on fire safety” grounds — and mobilised police to evict protestors. Reul, well known for his pro-fossil fuel lobbying activity, is still on the payroll of an RWE subsidiary company. Despite the temporary suspension of the forest-clearing, there is no certainty that clearing and mining won’t continue ahead in the future. Germany’s reputation as a green-energy-loving nation of sustainable recycling enthusiasts is not the only thing at stake, by expanding the mine, the country will give legitimacy to other nations and companies around the world, who are already less responsible than the German government. If coal once gains momentum, we can all rest assured that all our well-laid plans for climate change will go awry. This Saturday thousands of people are expected to demonstrate against RWE's coal mining plans. Take part in this mile stone-setting movement against fossil fuels!